In order to dynamically load up my navigation.html webpage, which appears on all pages except for my splash page. It should be on the top right side of the page (absolutely positioned). 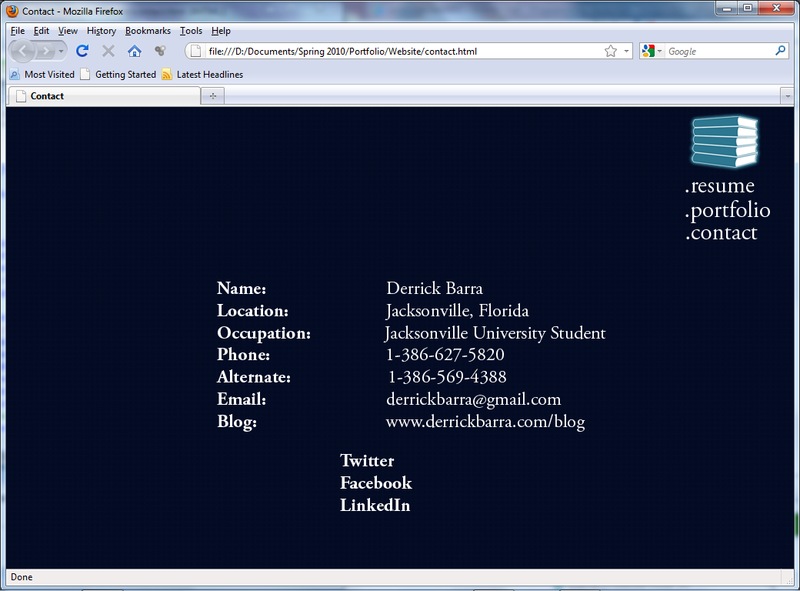 When I created this page in dreamweaver it tested fine locally but now that its online its not showing up. I've checked to make sure nothing is pointing to a local address. The script I'm using should automatically load the navigation.html page when the page is loaded. The code that loads the navigation page is below. The div that contains the navigation.html is the same size as the wrapper containing the contents of navigation.html. For reference heres what navigation.html looks like when working properly. So, even if it didn't have the highlighted syntax error, it wouldn't work. Move it to after the target division and correct the syntax error (remove the semi-colon). Thanks so much! I was unaware that the script had to be called after the div was created (makes sense in normal programming, didn't realize that was the way it worked in html).